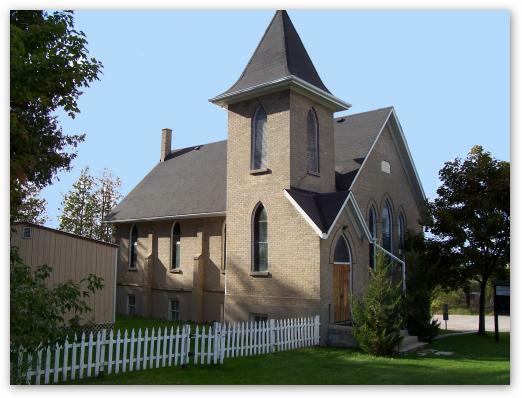 St. Paul’s Presbyterian Church in Leaskdale was the church that brought L.M. Montgomery to our community in 1911. She came as the bride of Reverend Ewan Macdonald from Prince Edward Island. She lived in Leaskdale as the minister’s wife, and at the same time, wrote 13 bestselling books. In 2006, St. Paul’s was 100 years old. It was very fitting, that year, that the congregation got their beautiful new church, just up the road. The original church was purchased by L.M.M.S.O. in 2006, and will continue to be cherished for its long and important history in the community. The church will be used as an interpretive centre to complete the L.M. Montgomery National Historic Site. It will also be used as a venue for entertainment and local events. It currently houses a tea room and gift shop. During the months of July and August site hours are 10:00 am – 4:00 pm. Special events are held year-round .